Audit, Finance, Customs, Central Excise, Defence, Revenue, Postal, Railway, RPF, Indian Informative Service. RRB, Armed Forces (Civil), Union Teritory Civil Service. Any degree from a recognised University, citizen of India. Age limit: 21-30 as on August 1st of the year. Civil Services Interview: Interview Calls sent in Mar-Apr and it take place in Apr-May. 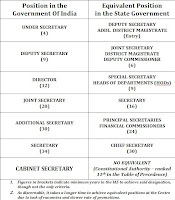 In addition to the salary civil servants receive various allowances such as Dearness Allowance, City compensatory Allowance, Leave Travel Allowance, Medical and subsidised housing. Important Note: Information provided may be incorrect or changed by Govt of India. Please visit UPSC website or contact UPSC offices at your regional center for details.